Here it is, the bread with graham cracker crumbs in it! I considered everyone’s advice about the confusion between graham flour and graham cracker crumbs. I waffled back and forth about which ingredient I would try but finally settled on graham cracker crumbs. 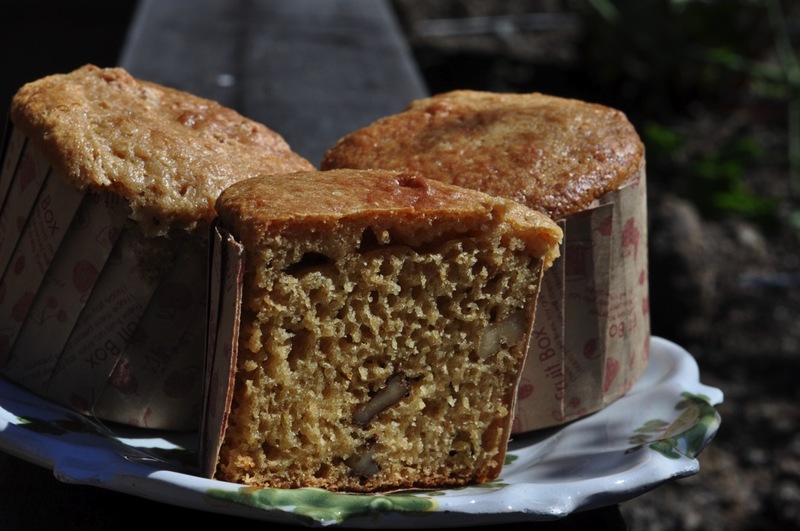 It was too unusual an addition (at least for me) to a quick bread not to try. Once I remembered to get graham crackers at the store (it took a few visits) I was ready to go. The rest of the ingredient list is short an simple. In fact, I almost didn’t notice something rather odd about this recipe: there are no eggs or oil. The only liquid and fat comes from milk. I’d say that makes this an easily veganized treat! I’ll admit, I was skeptical of the graham cracker crumbs. They looked so insignificant blended into the flour. Could they really add any flavor? I was wrong to doubt, as Joanne pointed out, graham crackers make everything better! This bread has a unique sweet, nutty flavor that I can only attribute to the crumbs. They probably also contribute to the beautiful golden brown color of this loaf. It borders on too sweet for me but the flavor is lovely and unique. The nuts are almost secondary to the bread in which they’re suspended. I felt like I’d entered a time warp eating my half-muffin bread tasting, like I was eating something people made during the depression when they were trying to come up with creative ways to use the ingredients they had on hand. That could very well be the era this recipe comes from. Helen’s file seems to include recipes from almost an entire century and from all over the country. Break out that food processor (or a plastic bag and hands for smashing) and make some graham cracker crumbs for a old-fashioned nut loaf. Then sit down for breakfast or with a cup of tea in the afternoon to enjoy a little time travel. I made 2 mini loaves and 3 large muffins…and had a bit of an overflow in the oven. In a large bowl, combine flour, graham cracker crumbs, baking powder, salt, and sugar, stirring with a whisk to blend completely. Pour buttermilk into flour mixture. Stir gently until combined. 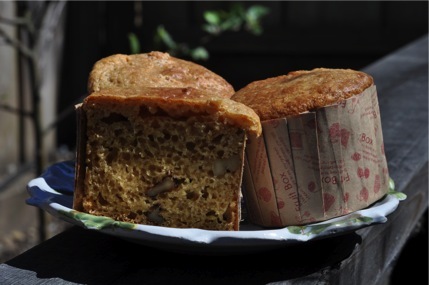 Pour batter into a greased loaf pan or mini loaf pans/muffin cups. Bake at 350 F for 35 minutes (mini loaves/muffins) to an hour (large loaf). Remove when the bread is golden brown and a toothpick inserted in the center comes out clean. Let cool, slice, sit, eat, and wonder if food is the best time machine we have.